Idea for a movie or a tv show? A sitcom maybe? Here is mine : It’s about a guy who lives alone in a small cozy house at the end of a small road that ends with a river next to it. 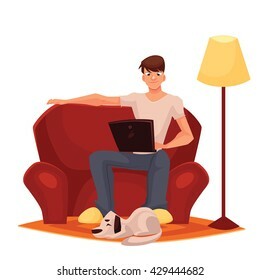 He lives in this house with just his dog as his loving and faithful companion who he got as a puppy once he started working from home. He lives his life with barely any friends that he can meet and that’s because unlike him, his friends are married and have kids and they rarely get chances to have dinner or drinks. But that’s ok since he has a very active online social life that counterbalances his lack of a social life. He wakes up, makes his coffee and takes a shower and shave and then makes breakfast while he feeds the dog. Then he works from 9 am till 1pm, makes lunch and then it’s back to work. In the evening it’s music and coffee and maybe he orders in a pizza or something else while he drinks a beer. He catches up on his tv shows and watches a movie at night before he and the dog fall asleep. The next day he continues this routine. During the weekends he takes the dog for long walks to the dog park or the beach and buys his groceries and maybe goes for a movie. However he prefers to stay in and buy his dvds / blurays and watch his tv series and movies in the comfort of his home so he still can be with his dog. And one day his life gets turned upside down when a beautiful woman who he has never met before comes to his home. Classic!